This week, a series of events are being held in Taipei to commemorate the 40th anniversary of the Taiwan Relations Act (TRA), a foundational document which undergirds unofficial and robust contemporary U.S-Taiwan relations. Among the themes that have been in the spotlight amid these events is Taiwan’s ongoing contributions to the Indo-Pacific region, both on its own terms as well as together with like-minded countries including the United States which is developing its own Free and Open Indo-Pacific Strategy (FOIPs) under U.S. President Donald Trump. As I have noted before in these pages, since the Trump administration’s unveiling of its Free and Open Indo-Pacific Strategy (FOIPs), Taiwan has been among the countries in the Asia-Pacific that has been attempting to frame its own response to this as well as to contribute to Washington’s ongoing strategy. In addition to advancing its own initiatives in the Indo-Pacific, including the pursuit of the New Southbound Policy, Taiwan has also sought to work with the United States as Washington continues to build out the three general pillars of FOIPs which U.S. officials have characterized as security, connectivity, and governance. 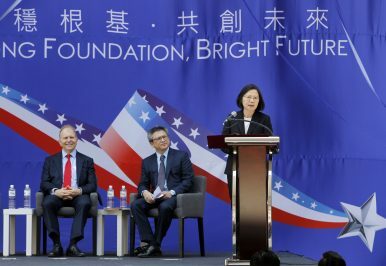 This is being done through a series of mechanisms in the U.S.-Taiwan relationship, including the Global Cooperation and Training Framework (GCTF) which was signed back in 2015. This week, Taiwan’s role in the Indo-Pacific has been in the spotlight again amid a series of events tied to the commemoration of the TRA. Of particular note were opening remarks given by President Tsai Ing-wen at this year’s iteration of the Indo-Pacific Security Dialogue conference on April 15, where she spotlighted some of Taipei’s ongoing efforts to contribute to the Indo-Pacific on its own terms as well as in partnership with the United States and other like-minded countries. Building on one aspect of the U.S.-Taiwan relationship which has been commemorated in several events in Taipei this week, Tsai framed Taiwan’s contributions with respect to the Indo-Pacific in terms of various lines of effort Taipei is currently undertaking as well as some future initiatives it was mulling as well. On the governance pillar, for example, she noted the holding of a civil society dialogue on religious freedom in the Indo-Pacific last month – making Taiwan the first country in the region to do so, in addition to the Women’s Economic Empowerment Summit which also kicked off in Taipei this week. And on connectivity, she referenced ongoing efforts by Taipei to work with U.S. institutions such as the Overseas Private Investment Corporation (OPIC) in order to provide assistance with respect to the pursuit of infrastructure projects in Southeast Asia, an issue that has been even more in the spotlight with China’s Belt and Road Initiative (BRI). U.S. and Taiwan officials have indicated that Taiwan’s contribution to FOIP is an ongoing process that will be further developed in coming months. Ongoing collaboration is being pursued in areas ranging from digital governance to energy to the sharing of best practices in law enforcement, with work on some aspects occurring in a quieter fashion. This is being helped by the development of new mechanisms to buttress aspects of this as well, with a case in point being the launch of a new Indo-Pacific Democratic Governance consultations last month, an annual dialogue which will provide a way for both sides to converse about governance issues. Both the United States and Taiwan are also increasingly working with like-minded partners where possible, and some of the manifestations have already been seen including in Japan’s first co-hosting of a workshop on anti-corruption under the GCTF framework last month. To be sure, despite Taiwan’s ongoing efforts to contribute to the Indo-Pacific, it faces no shortage of continued obstacles in doing so. For one, it continues to be challenging for Taipei to contribute in a context where its membership in institutions are restricted and when it faces continued coercion from Beijing (the string of events held this week, including a launch event at the new American Institute of Taiwan facility and Indo-Pacific Security Dialogue, were filled with buzz around the foray by Chinese military planes around Taiwan on Monday). For another, Tsai and the ruling DPP government will be continuing to advance these initiatives even as they are increasingly consumed by not only other domestic and foreign policy priorities, but also an upcoming election set to take place next January. These challenges and more will continue to test Tsai’s pledge at the Indo-Pacific Security Dialogue that Taiwan is ready, willing, and able to do more in the Indo-Pacific, even as it is clear that Taipei’s existing contributions are already worthy of mention.